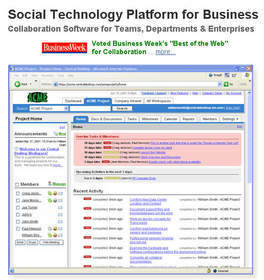 PASADENA, CA--(Marketwire - November 27, 2008) - Central Desktop, Inc. today announced the winners of its Social Technology for Social Good Contest. Audubon Dakota, Island Aid and Imerman Angels will each receive one-year subscription grants to enable them to better interact, share and manage their daily work activities from anywhere at anytime through collaboration software company Central Desktop's pure web based social technology platform for next-generation teams. "Choosing just three organizations was a really tough decision," said Isaac Garcia, CEO and Founder, Central Desktop, Inc. "Our social technology platform has the ability to support so many types of organizations that rely on grass-roots efforts and geographically dispersed teams of volunteers to get things done. We're just thrilled that we're in a position to help." Audubon's mission is to conserve and restore natural ecosystems, focusing on birds, other wildlife, and their habitats for the benefit of humanity and the earth's biological diversity. Central Desktop's platform will be used to strengthen Audubon Dakota's climate coalition team who are working in the fight to curb the effects of climate change. Audubon's collective actions toward global warming solutions range from climate legislation, to weatherization projects, renewable energy use, sustainability skill-shares, carbon credit programs, and more. Imerman Angels matches cancer fighters and caregivers 1-on-1 with someone who has survived the same type of cancer for support. For free. Worldwide. Central Desktop's platform will be used to support their small team of three paid employees who need help managing the efforts of hundreds of geographically dispersed volunteers as well as their organization's outreach, PR, marketing, fundraising and operational activities. Island Aid is a volunteer organization that utilizes an innovative ocean-based delivery network to provide emergency and long-term humanitarian assistance to communities affected by natural disasters. Their 'Sea-Bridge' remains the most effective solution for reconstruction support to tens of thousands of tsunami and quake survivors. Central Desktop's platform will be used to organize the hundreds of volunteers needed to support Island Aid's disaster relief efforts that include raising funds, organizing rescue and relief operations as well as internal projects to prepare for future disasters. Central Desktop delivers a pure web based social technology platform for progressive business teams to interact, share and manage their daily work activities from anywhere at anytime. Built collaboratively over the last three years with direct feedback from its users, the Central Desktop platform provides enterprise-grade functionality without enterprise solution resource requirements. Used by over 200,000 people worldwide, Central Desktop's customers represent next-generation organizations with geographically dispersed teams that are committed to using innovative web 2.0 tools for business success. Central Desktop serves organizations in technology, media, marketing and communications, professional services, architecture, design and many others. Central Desktop's social technology platform consistently delivers a 30% increase in productivity while decreasing the total cost of doing business. Key Central Desktop customers include: The Barack Obama Presidential Campaign, WebCor Builders, iSoldit, Gymboree, NXTV, Chapters of the Project Management Institute and the California Office of HIPAA Compliance. Founded in 2005, Central Desktop is a privately-held company located in Pasadena, California. For more information, visit www.centraldesktop.com.